Western blot analysis of extracts from 293T cells, mock transfected (-) or transfected with a construct expressing Myc/DDK-tagged full-length human Semaphorin-4D/CD100 protein (hSema4D-Myc/DDK; +), using Semaphorin-4D/CD100 (E8S8A) Rabbit mAb (upper), DYKDDDDK Tag Antibody #2368 (middle), and β-Actin (D6A8) Rabbit mAb #8457 (lower). 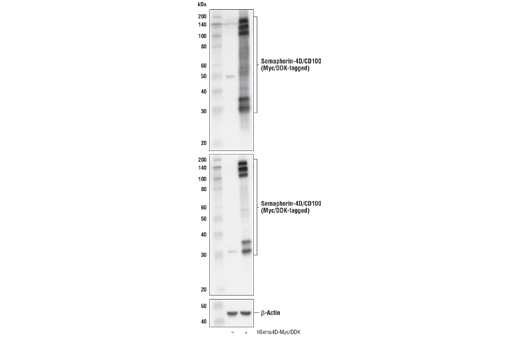 Western blot analysis of exctracts from HDLM-2, EL4, and P815 cells, using Semaphorin-4D/CD100 (E8S8A) Rabbit mAb. Western blot analysis of extracts from various cell lines using Semaphorin-4D/CD100 (E8S8A) Rabbit mAb (upper) and β-Actin (D6A8) Rabbit mAb #8457 (lower). As expected, Semaphorin-4D/CD100 protein is not expressed in PC-3 cells . Immunoprecipitation of Semaphorin-4D/CD100 from HDLM-2 cell extracts. Lane 1 is 10% input, lane 2 is Rabbit (DA1E) mAb IgG XP® Isotype Control #3900, and lane 3 is Semaphorin-4D/CD100 (E8S8A) Rabbit mAb. 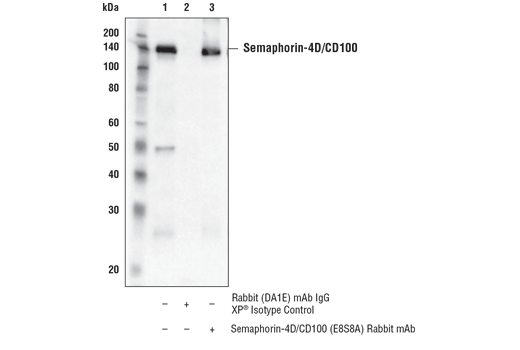 Western blot analysis was performed using Semaphorin-4D/CD100 (E8S8A) Rabbit mAb. Mouse Anti-Rabbit IgG (Conformation Specific) (L27A9) mAb (HRP Conjugate) #5127 was used for detection to avoid cross-reactivity with IgG. 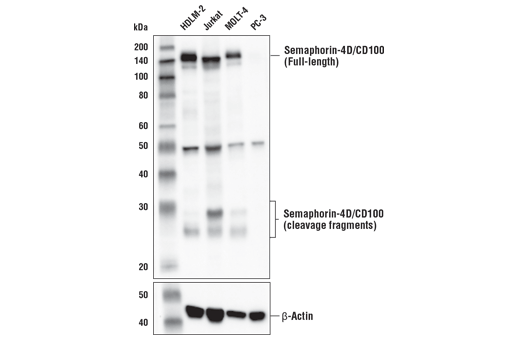 Semaphorin-4D/CD100 (E8S8A) Rabbit mAb recognizes endogenous levels of total Semaphorin-4D/CD100 protein. 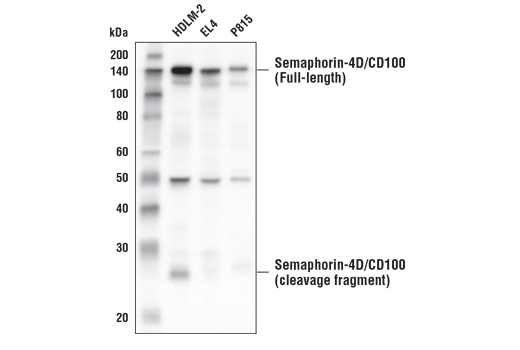 This antibody also recognizes 25 kDa and 28 kDa Semaphorin-4D/CD100 cleavage fragments containing the carboxy terminus. This antibody cross-reacts with an unidentified protein of 50 kDa in some cell extracts. Monoclonal antibody is produced by immunizing animals with a synthetic peptide corresponding to residues near the carboxy terminus of human Semaphorin-4D/CD100 protein.